Triangles are one of the fundamental figures used in geometry.Â It is a polygon with three vertices and three sides or edges, which are line segments. 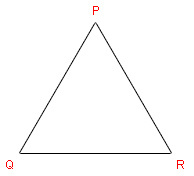 A triangle with vertices P, Q, R is denoted as triangle PQR and symbolically written as PQR. 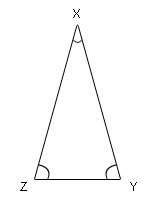 Triangles can be classified by its sides and angles. 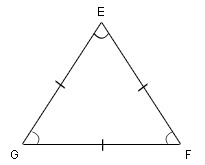 Triangle is one of the basic figures used in geometry. Like the rectangle and the circle, the triangle has enormous use in our practical life whether it is the structure of a bridge or holding up a shelf. Triangles are also used in reference to places that have a more-or-less triangular shape example – the Bermuda Triangle. Before we move to classify different forms of triangles, it is important to discuss some of the essential features of a triangle. 1. Scalene Triangle: Â The word Scalene came from the word meaning “uneven,” and a scalene triangle has three sides of different lengths. Not only are the three sides different but the three angles are also different. 2. Isosceles Triangle: An isosceles triangle has two sides that are equal in length, called legs and the third side is known as base.Â In an isosceles triangle, the angles opposite the equal sides are equal. In the above XYZ, the side XY=XZ and XYZ = XZY, so XYZ is classified as an Isosceles triangle. 1. 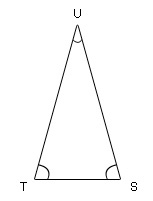 Acute Triangle: In an acute triangle all the three angles measure less than 90 degrees. 2. Right Triangle: In a right triangle, there is one right angle, which measures exactly 90Â°. This implies that the other two angles will be acute.Â In the above figure, the right angle square has been drawn at vertex N to show a right angle. 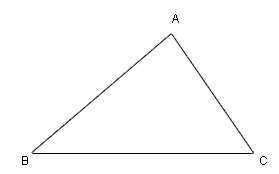 Moreover, as both the sides UT = US, then Â UTS is also an Isosceles triangle. In the above EFG, sides EG = EF = FG and Â EGF = Â EFG = Â GEF = 60Â°. These conditions imply that EFG is an equilateral triangle. If you feel you have a good understanding, move on to our Triangle Properties Test.